So, this is the first post on my new blog, and I thought I'd kick it off by looking at one of this season's biggest trends: tribal. Think lots of chunky jewellery, aztec and ethnic prints. I'm a huge fan of this trend. Above are just a few of my favourite tribal pieces from the high street at the moment, but there are plenty more out there to choose from too. It's one of the biggest trends of the summer, so all the shops are jumping on the tribal bandwagon! I particularly love the black and white ethnic print dress (6), it's midi length too so you're killing two trends with one, um, dress (I don't think that's how that saying is meant to go, but oh well!) You could also either wear it casually or throw on a statement necklace and team with killer heels for a night out/formal occasion. I recently bought two similar (though not tribal print) dresses from New Look, which I might show you in a future post if you're lucky! Oh, I almost forgot... Happy Easter! I'm off now to get some sleep before the mass chocolate consumption tomorrow. Alright, I'm lying, I'm gonna give in to the geek in me and watch Game of Thrones for a bit first... the new season may be starting tomorrow, but I'm still only half way through season 2. Got some catching up to do! Hope you all have a lovely day tomorrow! I'll be eating as much chocolate as humanly possible (atleast until my concience kicks in) and watching loads of brilliant/terrible bank holiday telly. 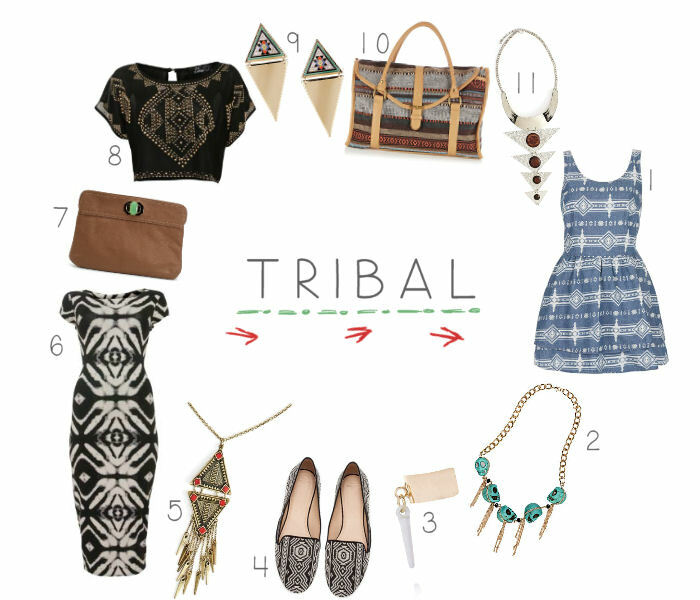 Love this post and all things tribal, thanks for sharing doll! Thanks! :) Yeah I'd love to follow eachother, I'm following you now on gfc and I've liked your facebook page. OOh number 6 is lovely, and a right bargain too! hi honey! wow so pretty! love these photos and i really love your blog :) what do you think about following each other?